VERNON — January marks the beginning of a new year, and for many of us that means making a fresh start. But for Vernon glassblower Victor Chiarizia, whose studio was completely destroyed by fire last month, starting over has taken on a more significant meaning. "It basically wiped us out," said Chiarizia of the devastating Dec. 19 fire that burned, beyond use, the post-and-beam studio barn he built in 1991 and added onto in 1994. Chiarizia may never know exactly what happened that morning. He was melting his glass as he did every Sunday morning in his backyard studio, loading the furnace with material before leaving to go up to the main house, which he shares with wife, Rain. A short time later, he discovered the fire, but by then it was already too late. Flames were coming out of the second floor windows. "We lost a lot of product," said Chiarizia, who estimates his damages at over $350,000. 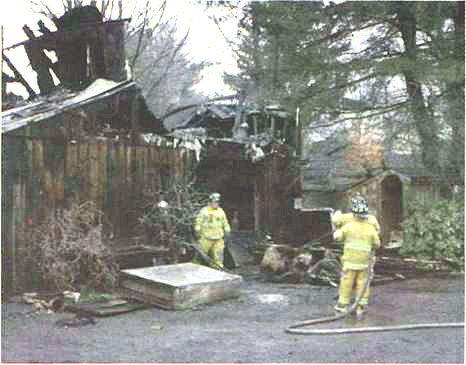 The fire also destroyed equipment, tools, sculpture, and tradeshow booths. Not that he can afford the luxury of sitting around and brooding over his losses. While he waits on an insurance settlement that will likely replace only the building itself, Chiarizia has been making four-day-a-week commutes to a friend's glass-blowing studio in Essex in order to remake shelf samples for a February tradeshow in Philadelphia. A few weeks there and then its up to a public studio in Worcester where he will need to go to recreate his larger pieces. It is crucial that the shelf samples be ready for the tradeshow. Destroyed. A Sunday morning fire in December completely destroyed Victor Chiarizia's glassblowing studio behind his home in the Talcottville section of Vernon. With help from local architect Bob Hurd, the Chiarizias hope to design a new carriage house-style studio. In the meantime, Chiarizia commutes to Essex and Worcester studios, trying to recreate lost work and shelf samples. Photo courtesy of Rain Chiarizia. (Below) Chiarizia's most acclaimed work, a series of sculptures called, "The Botanicals," which he works on for weeks at a time, is flameworked glass treated to multiple applications of lustrous, colorful enamels. His sculptures have been commissioned by the Palace Hotel in Beijing, the Sandwich Glass Museum, and the Smithsonian, and have been displayed in New York at Tiffany's and Bulgari. Image from the Web site www.victorchiarizia.com. Chiarizia participates in three shows a year, a week each in Baltimore and Philadelphia in February, then another week in Philadelphia in July, from which he garners a significant portion of his business. If that isn't enough pressure, he also only has a few weeks left to recreate an entire order that had been boxed and ready to ship to a hotel in Beijing. If he can't ship by early February, Chiarizia fears the Chinese developers will have to cancel the order. "I don't want to lose that order," said Chiarizia. Thankfully, the Chiarizia's aren't without support. Outside of family, which has offered both moral and monetary help, longtime customers have also come forward. Additionally, the Historic Talcottville Association, of which Rain Chiarizia was founder and first president, has offered to send out a fund-raiser mailing to the 1,400 to 1,500 names on Chiarizia's open studio mailing list. "The glass community has been very supportive," said Chiarizia, who has entertained offers to use glassblowing studios in Vermont, New Orleans, Santa Fe, and San Diego. He has also appealed to CERF, the Craft Emergency Relief Fund, which offers artists and craftsmen grants and loans due to major losses. In Chiarizia's case, CERF contacted the February tradeshow promoters to waive his booth fees, which can be costly. Perhaps one of the most difficult things for Chiarizia was being forced to bow out of some major exhibitions, including a 33rd international invitational at Habitat Galleries near Detroit. 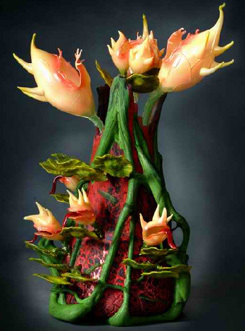 Major patrons attend the invitational where he has displayed his trademark series of flameworked glass botanical sculptures. "2004 was a good year," said Chiarizia. "I had fun. I had recognition in some major galleries. It will work out."